Hanger Arms Twist On for Bird Poles and wrap around any 1 in. dia. bird feeder pole. Very nice to be able to add extra hanger arms. There is a 8" hanger arm with a hook loop end that prevents wind and bouncing form dislodging the feeder. Hang any small feeder you like, for example a suet feeder. And a 6" dish that extends 14 inch from the pole. The clear dish can be used to hold bluebird mealworms, fruit, or 2 cups of seed. 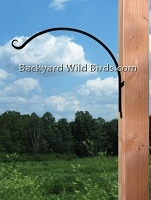 These bird feeder hanger arms need no tools, just twist on and it wraps around any 1 in. diameter bird pole. Lets you add arms and place where ever you like on the pole. Great for expanding an existing pole system to add more bird feeders. 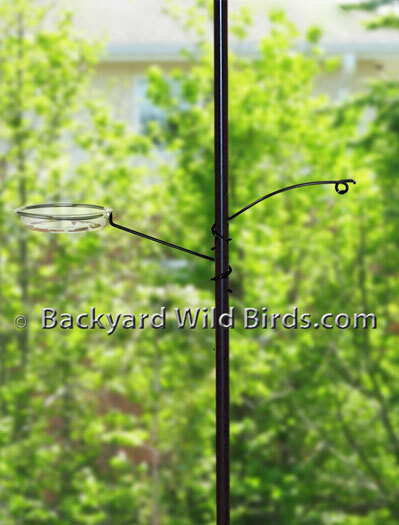 Suet bird feeders are one example that can be used on the extra 8" arm.